Dublin again! Happy memories of the 2012 and 2013 Moodlemoots in this fair city (which, in fact, I liked so much I am returning to next week with my son for a mini-break). Magnificently organised once more by Gavin Henrick supported by Dublin City University and the National Institute for Digital Learning, this year’s Moot trod new ground in that it had an HQ input courtesy of our Research Director Michael De Raadt. The idea was that, before the regular two day conference with keynotes and presentations (short ones – I like short presentations!) there would be Working groups where interested parties could discuss improvements they would like made to core Moodle – and the day after the conference, the usual developer “hackfest” would prioritise making those improvements happen. 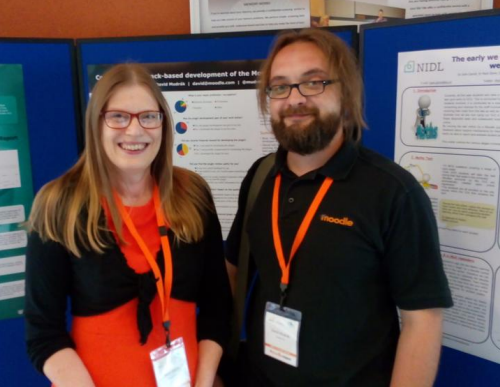 So- on Monday 11th May, I joined the “Dashboard” working group ably chaired by (the now bearded) Mark Glynn, while in the room next to us, discussions were being had over how to simplify the many forms admins and teachers have to complete during user, course and activity creation. I found my working group a very valuable experience because those present were happy to share their own organisations’ dashboard (“My home”) customisations, and for someone who has only ever seen Moodle’s default, I learned a lot, and we came up with a number of good suggestions. along with a 15 minute presentation on What We are Learning from Learn Moodle, the HQ-run MOOC Teaching with Moodle: An Introduction. We’ll be starting up again on August 9th so if you know any beginners, please tell them to sign up. 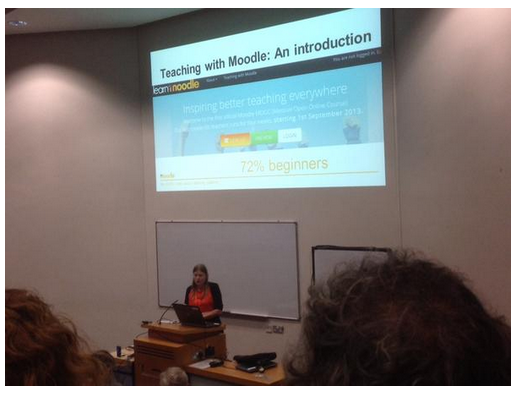 great stuff being done to make Moodle attractive and (dare I say it) less “Moodley” looking. One in particular is the stunning United for Wildlife site. 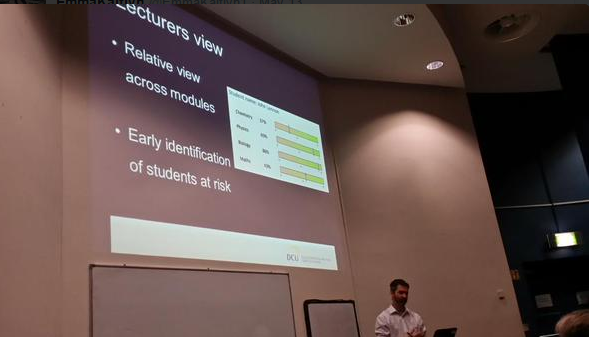 DCU’s purpose built Relative grades feature – something discussed in our Dashboard working group and presented during the main conference too. I can see this being extremely useful in all stages of education, to teacher, student or both. In terms of extra-curricular highlights – the endless pastries with morning and afternoon coffee, free Irish chocolates, Jelly Beans and the superb Gala Dinner at the Crowne Plaza hotel all made for an excellent atmosphere in which to network, talk Moodle and generally add extra inches to the waistline. I appreciated the chance to meet up with HQ people I don’t often see – as well as Martin, Michael and Business Analyst Danny Bonta, there was Plugins Liaison Manager David Mudrak (pictured below in front of a top class infographic ) and Integrator Dan Poltawski who actually only lives 20 minutes away from me but whom I think I haven’t met in person since 2011. David and Dan both gave interesting presentations on plugins and continuous integration respectively, valuable insights into the workings of Moodle HQ. This entry was posted in Moodle on May 17, 2015 by admin. Wish I had been there. Much interesting stuff. Thanks for the links. I always assumed Dan P lived in Australia.